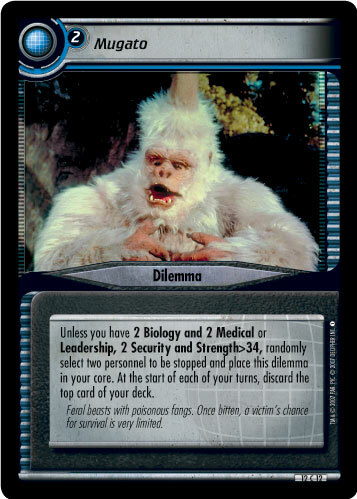 Unless you have 2 Biology and 2 Medical or Leadership, 2 Security and Strength>34, randomly select two personnel to be stopped and place this dilemma in your core. At the start of each of your turns, discard the top card of your deck. Feral beasts with poisonous fangs. Once bitten, a victim's chance for survival is very limited. Image Source: The Original Series: "A Private Little War"